When the iPads were first announced a few weeks ago, news quickly spread that T-Mobile would be offering 200MB of iPad data each month for life for free. However, today, when customers went to stores to grab the iPad, they were forced to pay $10 unless they were subscribed to voice smartphone plans on T-Mobile. 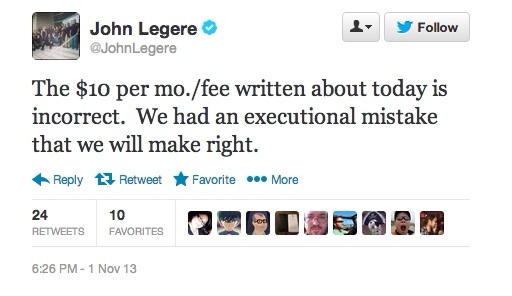 T-Mobile CEO John Legere was quick to respond on twitter to this issue, and claims the charges were an "executional mistake" and that the "situation will be corrected." 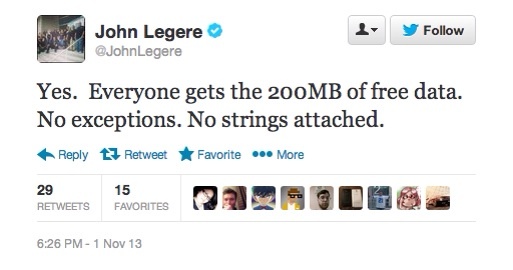 Legere claims everyone will be able to get the 200MB of free data with "no strings attached"
T-Mobile offers the new iPad Air starting at $0 down with 24 monthly payments of $26.25.